The most recently released record in the UK is a classical record. Bollani has recorded the Gershwin Piano Concerto and Rhapsody in Blue with the Leipzig Gewandhaus Orchestra. Bollani and Chailly talk through the ackground to this recording on video HERE. There are also a number of official and unofficial Youtube recordings of Bollani performing Gershwin in Rome with an Italian orchestra. Bollani has another project on the go with the Gewandhause Orchestra. They will be recording - and performing in the open air in the Augustusplatz in Leipzig on September 3rd - both of the Ravel piano concertos. In Italy, the Gershwin album has outsold by a factor of almost two-to-one his previous best-seller Bollani Carioca from 2008. Bollani has just made his debut recording on the Verve label. The recording of Bollani compositions by the NDR Big, performed live, was made on two subsequent evenings in front of a live audience in Hamburg in June 2010. The arrangements for big band are by the Norwegian Geir Lysne. Jeff Ballard is also on the recording. Bollani told me Lysne had re-imagined, re-invented Bollani's work and that he had enjoyed the experiowence of having to "relearn my own compositions." Bollani was performing at EJE Cagliari with his Italian quintet I Visionari. It's muscular, extrovert music. He also continues his association with, and to write for - both his Danish trio - with Jesper Bodilsen and Morten Lund - and his trumpet-piano duo with Enrico Rava. Last year Bollani was working in the two-piano format with Chick Corea and they performed a total of nine concerts, all in Italy. The two performances which they gave at Orvieto was recorded, and while there is no title for the album yet, ECM tell us it is due to appear in the autumn. This year Bollani is working again with Martial Solal (as in the video above from 2008). Bollani loves this collaboration: " [Solal] always plays the thing you're not expecting." The two pianists don't discuss any set order, it just happens. "With a singer, you have to agree a key, we don't need to do that." Chick Corea will tend to talk to Bollani about the records he's listening to - Bollani remebers one conversation about Jaki Byard - or what Corea has beens practising. With Solal, one conversation stood out: Bollani had wanted to find out more about Solal's improvised film soundtrack for he classic Jean-Luc Godard film Breathless/ A bout de Souffle." I thanked Bollani, a friendly person from the Cagliari staff took a photo, and off Bollani bounced to sound-check in front of an already-packed auditorium. 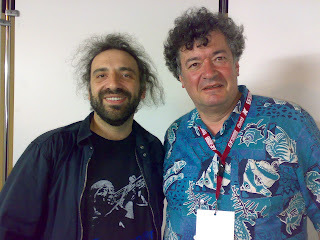 I’ve just been reading your interview with Stefano Bollani, and thought you might like to know that his piano duo recording with Chick Corea (currently titled will be released on ECM this autumn. The exact release date is still to be confirmed. What chance Bollani-Solal or Bollani-Corea in London?